Yes its true, boaters can expect to be offered free boat washes from stations at select boat launches throughout the state, especially in places like the Adirondacks. The purpose of these stations are to provide free boat washes while also helping to prevent the spread of certain invasive species. Everyone takes the time to give their cars a good wash periodically, but have you ever thought about how often you should be cleaning your boat? Boats can be carriers of invasive plants and animals. Most of the time, you can see these plants hanging off your propeller, bunks, and trailer and you can simply pick them off. However, some invasive species, like the young of zebra mussels and Asian Clams (called veligers) are so small they cannot be seen with the naked eye. Yet just adding a few of these into a lake or other waterbody is enough to start an invasion. When we wash our boats, also known as decontaminating, it reduces the chances of transporting harmful invasive species, such as zebra and quagga mussels, spiny waterfleas, or Asian clams, to additional waterbodies. How do boat wash stations work? Boat washing begins with a general boat and trailer inspection. A trained professional, typically a boat or watercraft steward, first checks over your boat to see if it needs to be cleaned. If a boat is noticeably dirty and has visible plant matter on it, or if the boat was previously in a different waterbody, there is a good chance the boat steward will offer to decontaminate your boat for free. After a visual inspection of the boat and trailer, the boat steward will ask you to lower your propeller, just low enough to check if there is any water in the engine. If water comes out, the engine will need to be flushed of that foreign water with 120o F water from the boat wash station. At pristine waterbodies like Lake George, boat stewards are more concerned with boats going into the lake that were previously elsewhere. In other lakes where many invasive species are already present, boat stewards may focus their decontamination efforts on boats exiting the water, to prevent furthering the spread of those species. Afterwards, if the boat steward determines that you also should have a full decontamination, they will begin cleaning your boat. The water in the boat wash station is heated up to 140oF with pressure as high as 1,400 PSI. This temperature and pressure has been shown to kill most animals and plants trying to hitchhike on your boat. For specific areas where electronics and engine components are exposed, lower pressure is used to prevent damage to the boats. Boat trailers with felt bunks will be soaked in 140 o F using a low pressure attachment to kill any invasive species that may be hitchhiking on this material. During the washing, it is important to wash the outside of the boat and trailer, including the propeller, hull, trailer hitch, and underneath the trailer. It is also important to flush the engine and drain the bilge to ensure the boat is properly decontaminated. Boat wash stations can recycle contaminated water and heat it again, ensuring that its runoff will not contaminate the waterbody. Boat stewards take special care to be sure that no damage happens to the boats during cleaning. Boat wash stations are an effective way to clean your boat of all invasives, including those that may be too small to see. Using the boat washing station is the most efficient and effective way to stop the spread of aquatic invasive species, while also providing a free cleaning of your boat and trailer! Thanks for helping keep New York’s pristine lakes and rivers clean, so we can continue to enjoy them for generations to come! Decontaminating your boat with a boat wash station is always suggested, but be aware that some lakes, such as Lake George, require you to get a decontamination before launching. 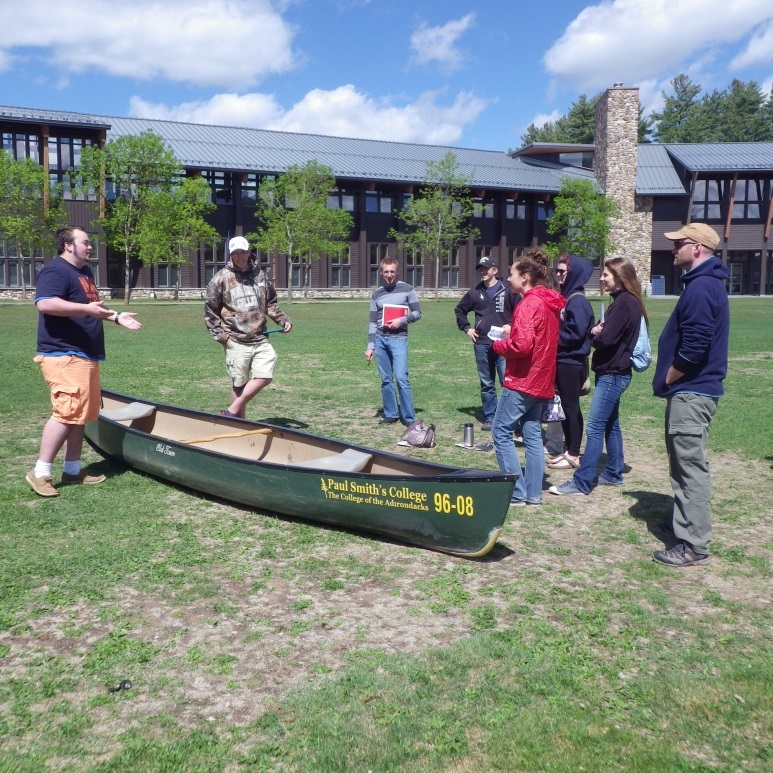 Heading to the Adirondacks or Lake George? Find a boat wash station here. This summer, State Parks will be opening two boat wash stations, one at Allan H. Treman State Marine Park and the other at Saratoga Lake State Boat Ramp. Since 2010, State Parks has hired seasonal Invasive Species Strike Teams to perform removals of terrestrial invasive plants in New York State Parks and Historic Sites. The work of the Strike Teams allows Parks staff to identify and protect areas of ecological significance that are vulnerable to the growing threat that invasive species pose. In 2016, two crews were hired, an Eastern Strike Team and a Western Strike Team. Each crew worked a 25-week field season (May 30 – November 18), camping out for much of the time and carrying heavy packs and gear to work sites. 2016 Eastern and Western Strike Teams, photo by Robert O’Brien, State Parks. The Eastern Strike Team covered Parks and Historic Sites in the Saratoga-Capital, Taconic, Palisades and Long Island regions. Over the course of the field season, the crew visited 29 parks in 12 counties. They worked on 38 different projects, targeting 32 invasive plant species. The top three focal species were: Oriental Bittersweet (Celastrus orbiculatus – 18 acres removed), Phragmites (Phragmites australis – 12 acres removed) and Japanese barberry (Berberis thunbergii – 10 acres removed). Surveys and invasives removals were done on a total of 98 acres. Taylor Ouderkirk, Casey Bannon, Mike Ferri, David Hendler, photo by Taylor Ouderkirk, State Parks. Left: Eastern Strike Team removes Asiatic sand-sedge at Jones Beach, NY; Right: Strike Team member David Hendler removes black swallow-wort, photos by Casey Bannon, State Parks. The Eastern Strike Team also spent a portion of their time surveying for the Southern Pine Beetle, an insect native to the southeast U.S., which has spread to the northeast, causing large-scale pine die-off on Long Island. The beetle has been detected in traps in State Parks in the Hudson Valley, but no confirmed infestations have yet been found in Pitch Pines in that region. 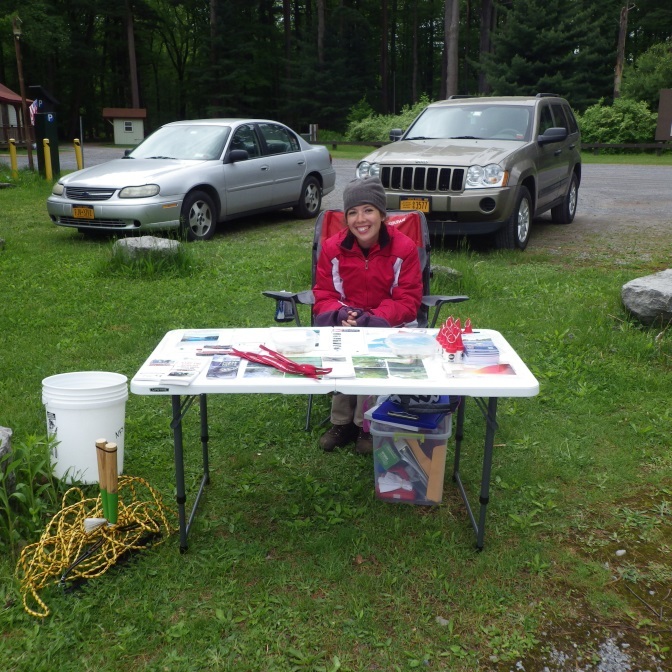 Surveys were conducted in Schunnemunk State Park, Harriman State Park, and Minnewaska State Park Preserve. The Eastern Strike Team performs Southern Pine Beetle surveys at Minnewaska State Park Preserve, photo by Sarah Travalio, State Parks. The Western Strike Team focused on the Finger Lakes, Central, Thousand Islands, Niagara, Allegany and Genesee Regions. Over the course of the field season, they visited 22 parks in 15 counties. They worked on 50 different projects, targeting 19 invasive plant species. The top three focal species were: Pale Swallowwort (Cynanchum rossicum), Honeysuckle (Lonicera spp.) and Buckthorn (Rhamnus spp.). Topping the ranks in numbers or volume removed were: 2.79 acres of Japanese Knotweed (Fallopia japonica) surveyed and removed, 35,025 Garlic Mustard (Alliaria petiolata ) plants, 34 bags of Pale Swallowwort (Cynanchum rossicum), and 7 dumpsters filled with Phragmites (Phragmites australis). The 2016 Western Strike Team (left to right): Sienna McDonald, Phil Bossert, Dallas Ortel, and Melissa Kirby, photo by State Parks. Western Strike Team members Phil Bossert (left) and Dallas Ortel (right) remove honeysuckle at John Burroughs Memorial Field State Historic Site, photos by Sarah Travalio, State Parks. State Parks also hired two Forest Health Specialists to perform surveys for two non-native insect pests: Hemlock Woolly Adelgid (HWA) and Emerald Ash Borer (EAB). These surveys alert New York State Parks invasive species staff to new infestations, assist staff in identifying infested trees that can potentially be saved and allow for the identification and removal of trees that may pose a risk to the safety of park patrons. Forest Health Specialists also performed HWA canopy monitoring (tree-climbing) surveys at sites where HWA-infested trees had been treated previously with chemical insecticides. At these sites, the crew collected data on infestation levels and overall tree health in order to assist invasive species staff in monitoring the effectiveness of treatments. Over the course of the 18-week field season, the crew was able to visit 17 different parks. HWA canopy monitoring surveys were performed in 8 parks, and a total of 42 trees were surveyed. All hemlock trees that had been treated with insecticides in previous years showed either no sign of infestation or signs of improvement. Emerald Ash Borer (EAB) surveys were performed in 14 different parks, and the crew confirmed two new sites of EAB infestation. Forest Health Specialists Jacob Sidey and Abigail Pierson prepare to climb a hemlock at Robert H. Treman State Park and Abigail shows how they climb using just ropes and no spikes, photos by Sarah Travalio, State Parks. Surveying hemlocks: Jacob Sidey (left and center) at Mine Kill State Park and Abigail Pierson (right) at Robert H Treman State Park, photos by Sarah Travalio, State Parks. The New York State Park’s Boat Steward Program is one of many boat steward programs throughout New York State. 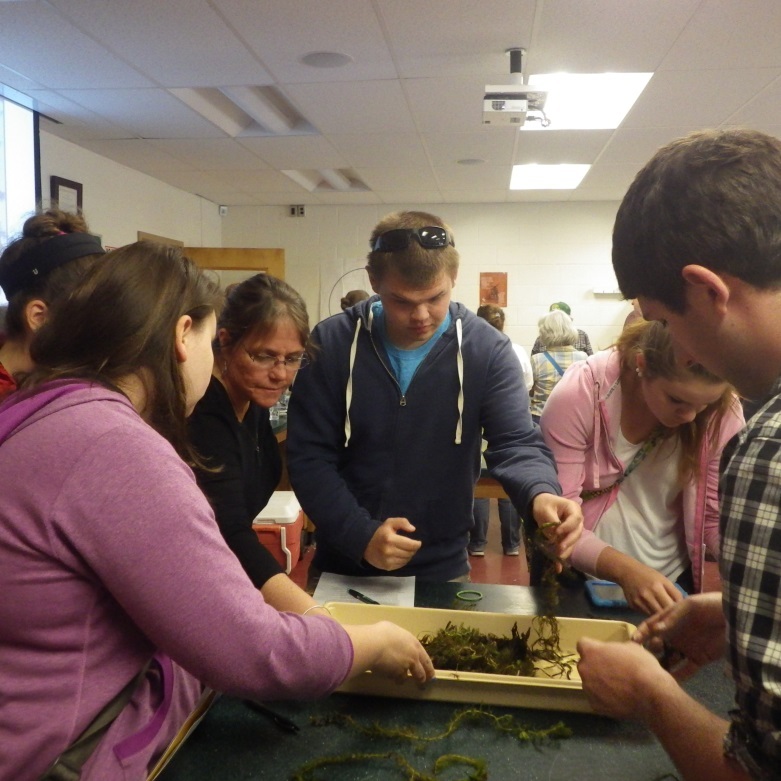 These programs provide targeted educational programming to increase awareness about aquatic invasive species (AIS) and other environmentally significant issues. Ariana London, Lake Champlain Steward, completes a boater survey on her tablet computer at the Great Chazy boat launch in 2015, photo by Meg Phillips, State Parks. Did you know that NY State Parks adopted regulations in 2015 to help try to protect our lakes and rivers from the costly effects of invasive species? Find an FAQ about the new regulations here. shall not launch or retrieve their watercraft from a Parks-owned boat launch facility unless the watercraft’s water-containing compartments (livewell, bilge, bait bucket) are dry. has inspected the watercraft to ensure that there is not plant or animal material attached to the motor, trailer, body of the vessel, etc. The Boat Steward Program has stewards at many of our Parks-owned boat launches across the state who conduct educational boat inspections to provide step-by-step instructions on ways you can effectively inspect your boat and dispose of invasive species. These demonstrations are both free and voluntary. Boat Stewards can help you learn about what to do to prevent spreading aquatic invasives and what to look for. They are primarily educators and do not play a role in the enforcement of regulations. Many Parks-owned boat launches across the state are also equipped with disposal stations for aquatic plant or animal material. The disposal stations are designed to provide a place for plant or animal material to dry out in an upland area. The dried out material is typically collected and placed in the garbage to prevent any further spread. When you come across a red-shirted Boat Steward, please stop and ask any questions you may have. Becca Reile, Buffalo Harbor Steward, completes a boat inspection in 2015, photo by Meg Phillips, State Parks. Approximately 500 bags, or around 12.5 tons, of water chestnut were removed from Selkirk Shores State Park. Jared Reed, Saratoga Lake Steward, participates in Invasive Species Awareness Week in Albany , photo by Matt Brincka, State Parks. Kelly Butterfield, Sunset Bay Steward, and Holly Flanigan, Fort Niagara Steward, pulling water chestnut (an aquatic invasive species) at Grindstone Marsh in Selkirk Shores State Park, photo by Matt Brincka, State Parks. Click on these links for more information about the Boat Steward Program and aquatic invasive species. If you are interested in volunteering to help remove invasive species in your area, become a member of your local Partners for Regional Invasive Species Management (PRISM) program. If you are interesting in seasonal work removing invasive species in State Parks, check out the State Parks employment page.